ATENEO made it two in a row to start UAAP Season 80 after breezing past University of the Philippines, 92-71, on Wednesday at the Smart Araneta Coliseum in Quezon City. Out with a sprain in their first match, highly touted rookie Tyler Tio turned out to be the difference maker as his fourth quarter offensive spurt allowed the Blue Eagles to break the game wide open and take the fight out of the Maroons for good. Leading by just 11 entering the final period, the Fil-Canadian Xavier product scored 10 straight points in the fourth period, including back-to-back three pointers to give the Blue Eagles a 70-51 lead with 8:38 remaining in the game. That turned out to be what the Blue Eagles really needed after spending the first three quarters trying to break away from a stubborn UP side and win their first meeting against their neighbors in Katipunan. “One of the things that coach Tab [Baldwin] said at halftime was we needed to play better defense and take care of the ball more. They shot 44 percent in the first half we brought that down to 37 percent. That’s a big improvement,” said assistant coach Sandy Arespacochaga. “When we get the ball moving, we don't know where the offense will come from, and that's the good thing. It can come from different people. That's one of the reasons it will be harder to defend this team. We'd like to continue playing that way,” he added. The Blue Eagles were quick to impose their size on the Fighting Maroons, feasting on their smaller counterparts early in the half with Chibueze Ikeh, Isaac Go and Aaron Black all crashing the boards as the Blue Eagles started to pad their lead early on. In total, the Blue Eagles outrebounded the Fighting Maroons 51-38 but the most glaring stat line would be Ateneo’s second chance points where they outscored their foes 31-7. Thirdy Ravena continued his impressive season as he finished with 16 points and six rebounds in less than 20 minutes of action. Tio, on the other hand, made one hell of a debut for the Blue Eagles, finishing with 14 points on a perfect six-of-six shooting and added two assists in just 11 minutes of action. Black added nine points, 10 rebounds and three assists as Ikeh finished with the same number of points alongside seven rebounds. As Tio took the spotlight for Ateneo, another rookie made a good account of himself for UP with Juan Gomez De Liano pacing the Maroons with 16 points, seven rebounds and two steals in the loss. Jun Manzo added 14 points but the lack of production from star guard Paul Desiderio proved to be costly for the Maroons. Coming off a 17-point performance and the game winner in their 74-73 win over UST win last Sunday, Desiderio was limited to just nine points on 4-18 shooting. With the loss, the Maroons dropped to 1-1. 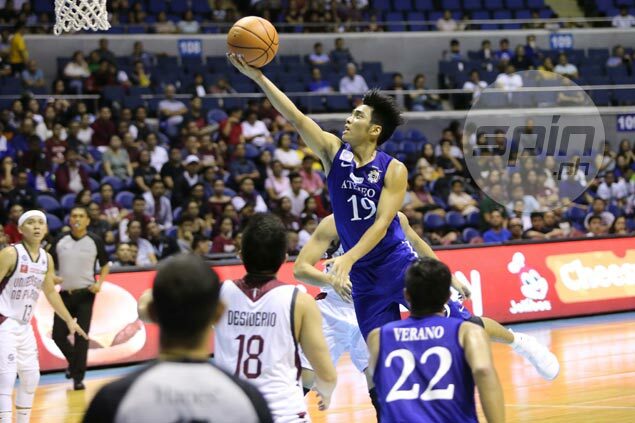 Ateneo 92 – Ravena 16, Tio 14, Black 9, Ikeh 9, Asistio 7, Nieto Ma. 7, Verano 7, Go 6, Nieto Ma. 5, Porter 4, Mendoza 3, Mamuyac 2, Mallillin 2, Tolentino 1, Andrade 0, White 0. UP 71 – De Liaño Ju. 16, Manzo 14, Lim 10, Desiderio 9, De Liaño Ja. 6, Prado 6, Webb 3, Romero 3, Ouattara 2, Lao 2, Vito 0, Harris 0, Dario 0.